Click the image to view the autograph album in a page-turning viewer. 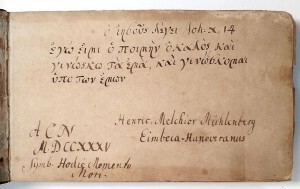 Autograph album of Henry Melchior Muhlenberg containing messages, prayers, and biblical quotations from German friends and acquaintances in Gottingen, Leipzig, Grosshennersdorf, Polzig, Hannover, Weissefels, Kostritz, Langendorff, Halle, Einbeck, and Kensington. Primary language: German. Secondary languages: Greek, Ancient (to 1453); Latin; English; French; Hebrew.